Invisalign is an excellent way to straighten your crooked teeth. This procedure is ideal for adults that want straight teeth but do not want to wear metal braces. Traditional braces are extremely effective but impact a person’s appearance and Invisalign is the alternative procedure that does not. There are several pros to wearing metal braces. The biggest pro is that they can correct a misaligned bite and help with jaw issues. These issues require a more intensive treatment plan and metal braces are able to provide that. It also means that they can be uncomfortable and even painful and require many trips to the orthodontist to have them adjusted along with having wires and rubber bands replaced on a frequent basis. Invisalign is ideal for people that simply need to straighten their teeth and move them into position. The process works by using a device called an aligner. The aligner is a clear plastic piece that fits completely around your teeth and fits securely the same way a retainer would. It is made of clear plastic and is virtually invisible. This makes it possible to straighten your teeth without anyone noticing that you are undergoing a dental procedure. This treatment option is also more convenient for busy people because at the beginning of your procedure you will be given a full series of aligners. Every two weeks you will replace the old aligner with a new one that will move your teeth one step closer to your goal. Since this is done at home, it is more convenient than needing to schedule an office visit each time you need an adjustment. If you travel a lot for work, are going away to college, or have kids to run around, you don’t have to worry about finding ways to squeeze appointments in. You will need to see the dentist occasionally to make sure that your teeth are moving as they should but less frequently than traditional braces. Another clear benefit of Invisalign is that the aligner only needs to be worn for 22 hours a day. This means that you can take it out to enjoy your favorite burger, plate of ribs, or a romantic dinner. You can also take it out to brush your teeth. This means that you don’t have to use any extra tools in order to clean your teeth, instead you can simply remove your aligner and brush both your teeth and the aligner with a soft toothbrush and toothpaste. This is far more convenient than trying to brush and floss in between wires and metal brackets. 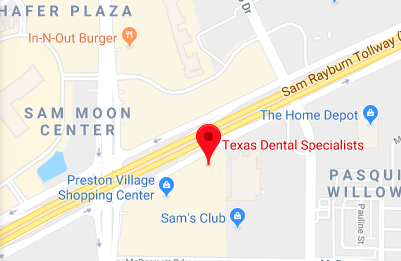 Texas Dental Specialists is the Plano destination for Invisalign. We are experts at performing this procedure and will work with you to create a treatment plan that accomplishes your smile goals. To find out if you are a good candidate or to schedule a consultation, call our office at (214) 619-6329.